Eyebrow Transplant is fast becoming a trend in today’s society. The Procedure is suitable for all skin types. This is a simple surgical procedure for both men and women. So many women have spend years plucking their eyebrows as a result are left with permanent hair loss. The only way to get your eyebrows back is to have them surgically implanted. A simple process and cost effective giving you those eyebrows back. Price start from £2500 depending on patient requirements. So How Does An Eyebrow Transplant Work? Hair is transplanted hair cells from the donor site to the recipient region using one of two methods. FUT also known as follicular unit transplantation or FUE or follicular unit extraction. Both have equal results however, the FUT may only be conducted by a registered Surgeon where an FUE may be conducted by a GP. If you would like to find out more about an eyebrow transplant please give us a ring or arrange a free consultation. At Consultation our specialist consultants will discuss your suitability, the procedure itself as well as pricing which varies from patient to patient. Your medical history will also be discussed. Your initial consultation will be with a qualified TTS Reg. Trichologist who will answer any questions you have. 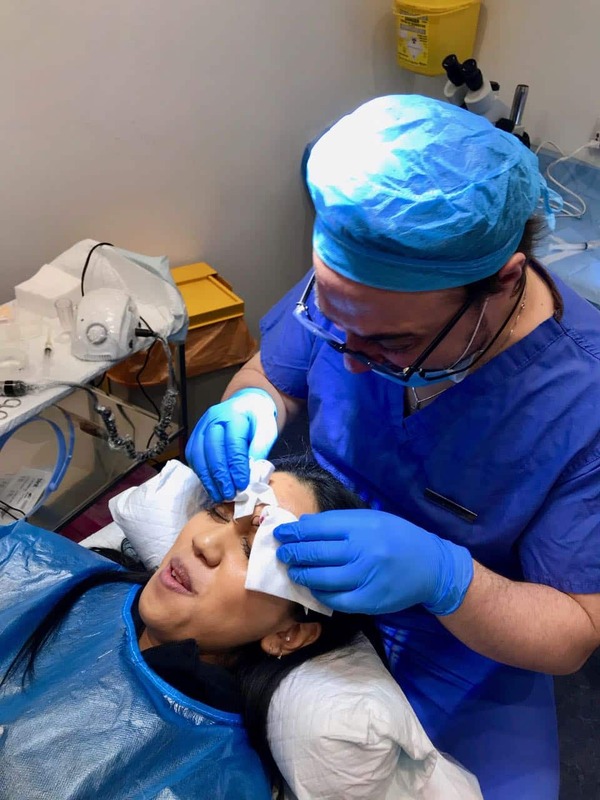 We will then invite you to meet our experienced Eyebrow Surgeon Dr Luciano Sciacca will be happy to see you. It is important that you see the Surgeon before hand to make sure you feel comfortable. There is no obligation and we do not have sales persons working at out practice. We only have medical personnel who are very experienced in this field of cosmetic surgery. All surgical procedure have a level of risk attached. 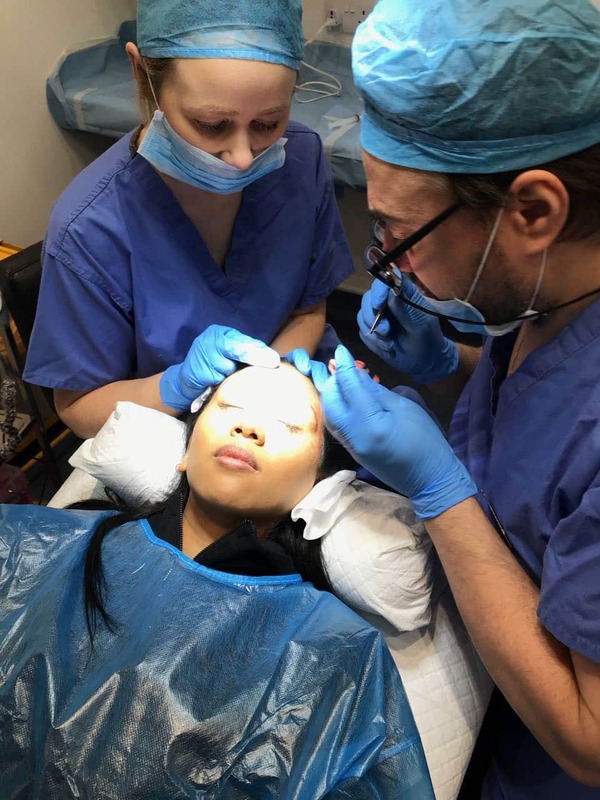 An eyebrow transplant is considered minor cosmetic surgery under local anaesthetic. However, when conducted in the right way by a highly experiences surgeon those risk are minimal. An eyebrow transplant will take a matter of hours to complete almost like going to the dentist. Most noteworthy being that an eyebrow transplant involves only a small amount of donor hair. Although there is always a possibility of the hairs rejecting, it is unlikely and the success rate is excellent. This procedure may be conducted on both men and women. Although the majority of patients tend to be female. This is a life changing opportunity to gain back that confidence. Have the perfect eyebrows just as you have always wanted. We would be please to answer any questions that you have in relation to an eyebrow transplant so give us a ring. You can arrange a free consultation with our team of specialists surgeons. You are under local anaesthetic so you will not feel any pain. The initial injections may hold a degree of discomfort. How long will the hair take to grow? This varies from immediate to 18 months. Can I have a procedure if I have HIV? The answer is yes. We will of course discuss your medical status and will only conduct a procedure if there is no risk to yourself. Can I have a transplant with Alopecia Areata? Most cases of Alopecia Areata would prevent a hair transplant taking place. However, in some cases this is possible. There are a lot of factors to consider. If you have lost your eyebrows through alopecia of the eyebrows or universals then we are unable to help. How much time do I need to take off work? Most patients take a week off work as this will reduce the risk of damaging the grafts. You can however go back to work within a few days if this is required.